After our full day yesterday we planned on taking it easy this morning and washing some clothes. I proceeded to figure out the washing machine. I should have paid more attention when our host showed me how to use it, but I was so tired when we arrived I couldn’t concentrate. How hard could it be to use a washing machine anyway? I loaded it up with the delicate setting and waited for it to wash. It went through its cycle and finished but did not spin so I waited…oh oh, it started over again and again and again. Finally,I realized it was not going to spin and I took a chance and quickly grabbed the clothes before it started to fill again as it was a front loading. To my dismay I found some of my lingerie had no elastic left in them! I was really careful with the next load, I noticed that the setting on the dial stated, “Cont”; I guess that means to continue, and it saves energy as it does not spin. You take the clothes out and wring them by hand. I didn’t save much energy on that first load. I found the settings for one short cycle with spin and made up for my earlier blunder. Most people in this neighbourhood had no dryers; this is very common in most parts of the world. Here, in Trastevere and much of Italy the wash is strung across narrow roads, over balconies, on lines or a plastic twirler. I really enjoyed the fresh smell of the sheets. It reminded me of my mom hanging out clothes in our back yard when I was little; sometimes they froze stiff on the line, but no chance of that happening here. 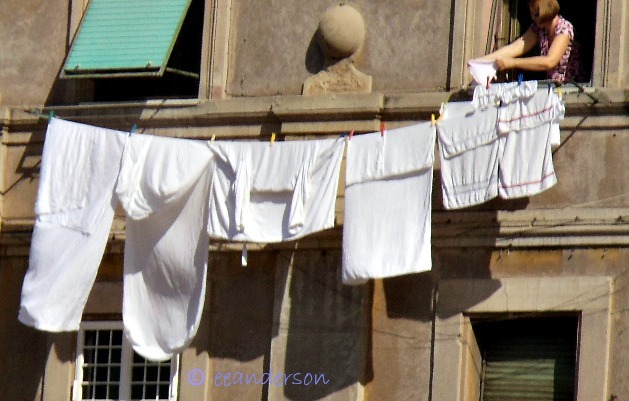 I watched the ladies expertly handle those large sheets shaking them out bringing them together like an accordion; shaking some more until all the wrinkles were out, and then unfolding them over the railings to dry. I struggled with them and couldn’t imagine doing this week after week. I always do a bit of hand washing at home and on the road, but I use my drier in Canada-I want to be energy conscious really…but just don’t want to take the time. Our condo association in Mexico made it a rule not to hang cloths over the balcony, not even a damp beach towel. It is strange because Mexicans, in general hang the wash. I suppose it is because the majority in our building are Canadian or from the United States. When the wash was done and we were rested we headed out to see the Trevi fountain. It was nice to see it lit up at night, and of course we threw in our coins. We had to make sure we would be returning. 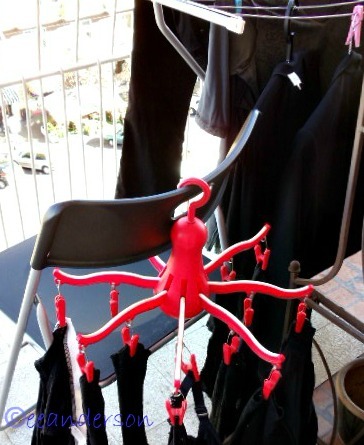 I wonder how may people hang their clothes to dry. 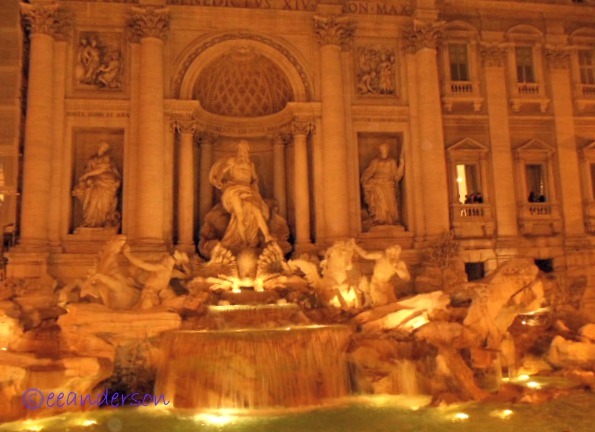 This entry was posted in Italy, Rome, Travel and tagged Italy, Laundry, Trastevere, Trevi fountain, wash day. Bookmark the permalink. 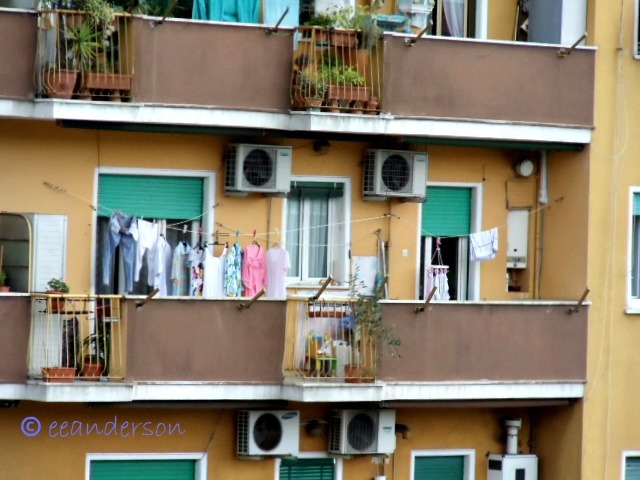 The sight of laundry is one of my favorites in Italy – great post! Thanks for your comment. I like seeing the laundry also. I can almost smell the freshness when I watch it blowing in the breeze. It gives me such a nice feeling. So true it is also an issue of space. My moms towels weren’t as fluffy either especially when she brought them in frozen to finish drying in the house. I never thought about the sun removing stains…good point. Thank you for dropping by, it was fun to read your comment and the added information.